You can't express what being back means to you. You're not good with words. 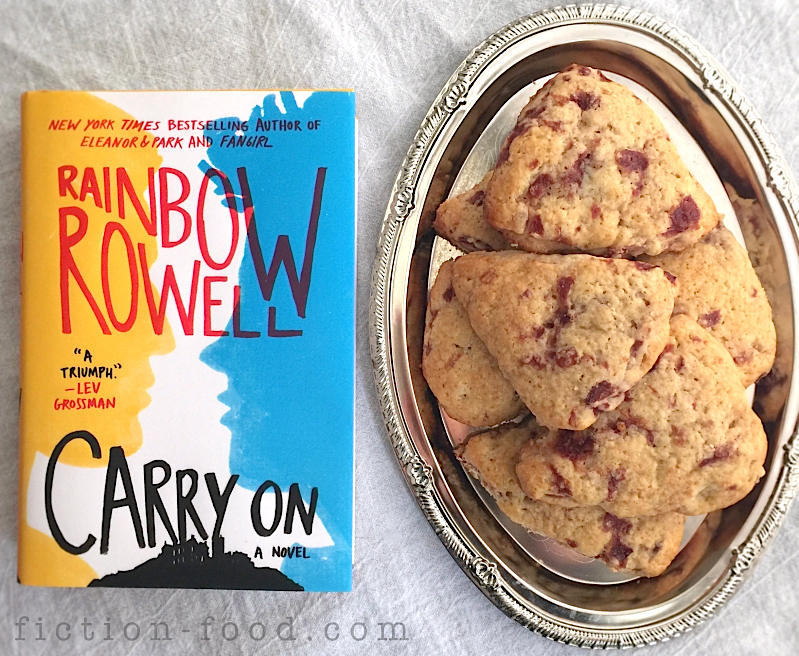 But perhaps the way you're devouring the plate of sour cherry scones Penelope laid in front of you–number one on your list of Things I Miss Most About Watford (the scones are first, Penny is very a close second)–will communicate the feeling. 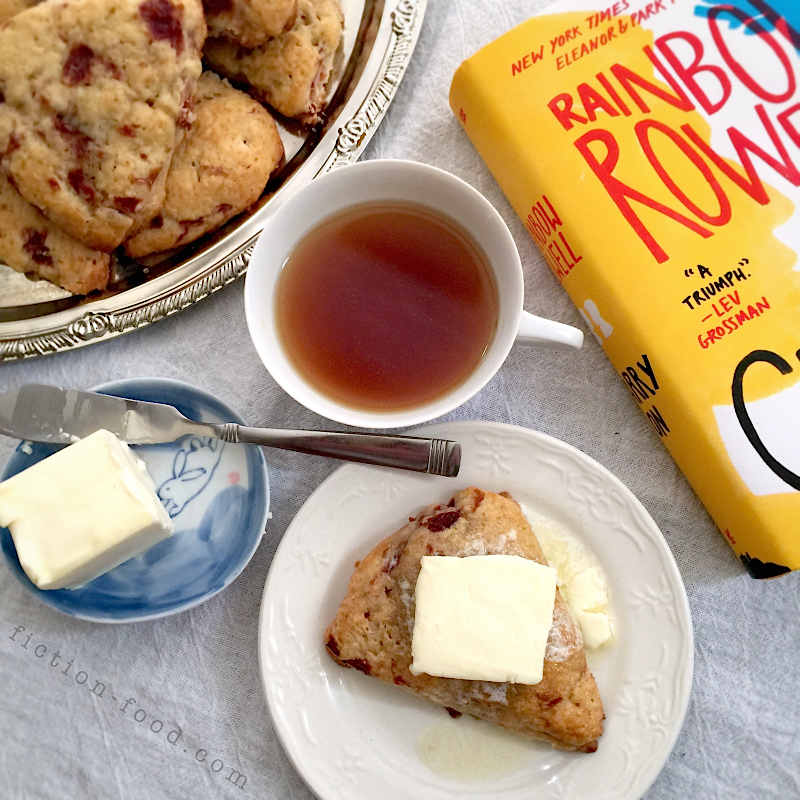 You load the scones with slabs of butter and shove them into your mouth. Penny gives you a disturbed look across the dinning hall table, but you can see the softness at the edges of her eyes and the tiniest hint of a smile catching at the corner of her mouth. You take another bite, closing you're eyes and pausing just long enough to savor the way the butter–melty on the outside, still slightly chilled in the middle–presses into the warm flaky dough as your teeth sink in, and how it mixes with the tartness of the cherries to create the perfect, rich, comforting combination over your tongue. God, you missed this place. The only thing disrupting the moment is not knowing where your (almost certainly evil) roommate is. His absence twists a subtle knot in your chest and you know you won't have any peace until you know where he is and what he's up to. Is he scheming your death for the umpteenth time? (Probably while playing his violin like a freaking savant with a smug grin on his perfect, grey features. Ugh.) Is he with his elitist family hatching a plan to take down the Mage so they can gain control of the Coven? (Most likely lounging in an ornate, oversized armchair and impeccably dressed as always. Gah!) It's still early yet, you're sure Baz will turn up soon enough–hopefully not catching you unawares with some deadly trick or spell. (Or with his freaking vampire fangs. Geez.) Then the days and nights of fighting, near misses, and tracking his every move will begin. You should enjoy his absence while you can. 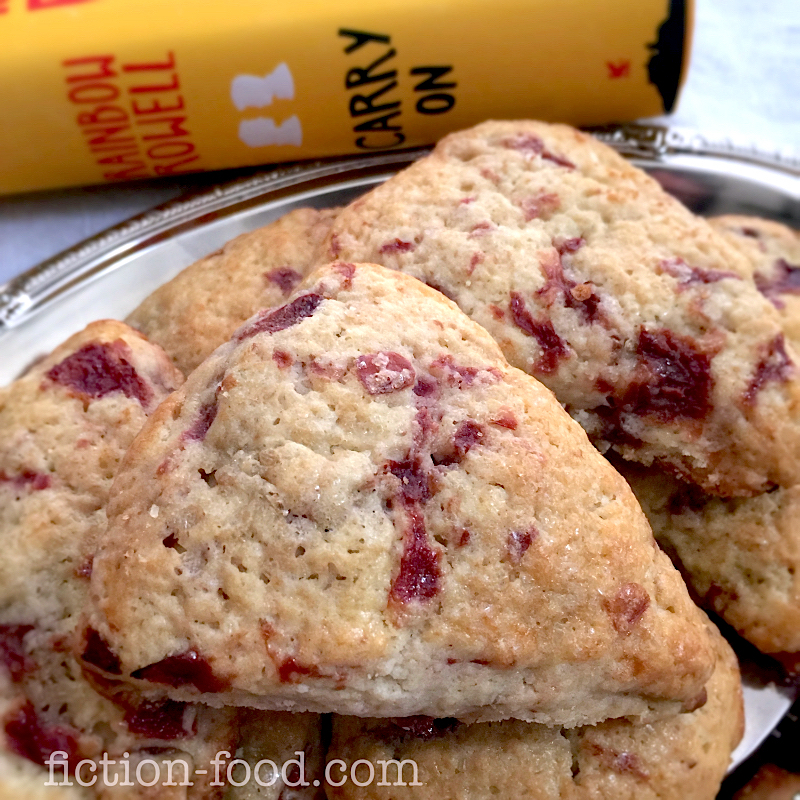 I'd never had sour cherry scones before Watford. Just raisin ones–and more often plain, and always something that came from the shop, then got left in an oven too long. I always have tea with Penelope and Agatha, and I'm the only one of us who ever eats the scones...Once Penelope tried to calculate how many scones I've eaten since we started at Watford, but she got bored before she got the answer. I just can't pass up the scones if they're there. They're soft and light and a little bit salty. Sometimes I dream about them. Penelope gets us a plate of cheese sandwiches and a mountain of warm scones, and I tear through half a block of butter. 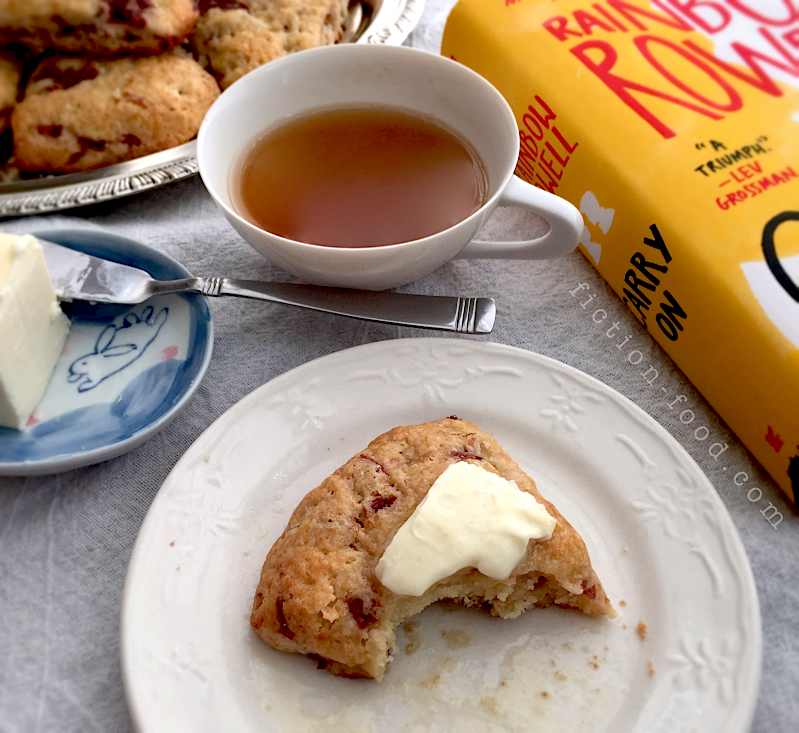 (I eat my scones with big slabs of it, so the butter melts on the outside but keeps a cold bite in the middle.) Penny's watching me like I'm mildly disgusting, but also like she'd missed me. 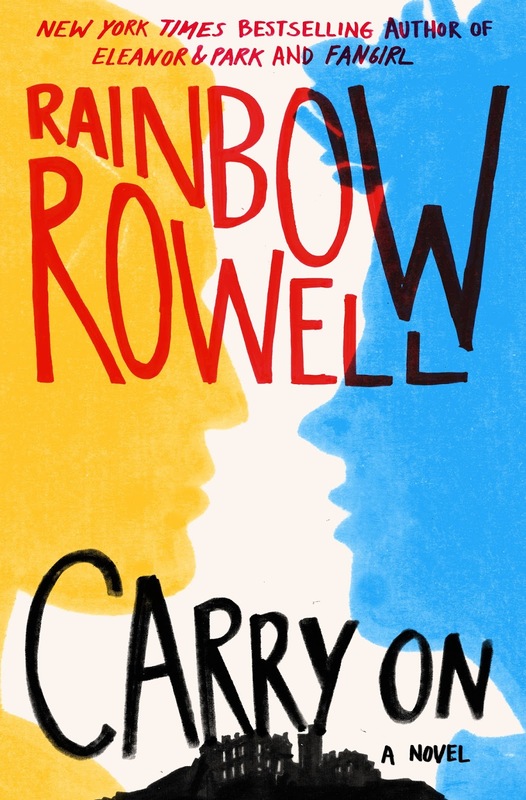 Moving, engrossing, tender, hopeful, Carry On is Rainbow Rowell's (cannon) take on the fictional fantasy novels and corresponding fanfiction she created for the world of her contemporary novel Fangirl. Nestled between each chapter of Fangirl is an except of the fictional Simon Snow fantasy novels, or fanfiction written by Fangirl's main character based on those novels. It's a little meta to describe. But I read Fangirl first (and loved it), and then leapt open-armed into Carry On and came out dizzy. (You don't have to read it in that order, but that's what I decided. I do wonder what the experience would have been if I did it in reverse...) I recommend both books very (very!) highly. Note: I'm used to making scones in wedges, but please feel free to make dollops/mounds, or even put the dough in a muffin tin. I think this would probably be more accurate to the story actually, as one point it mentions that Simon makes something like scone-butter-sandwiches. Also, I used canned sour cherries (in water) because now is not fresh cherry season, and I didn't see any dried tart cherries at the store. Canned cherries are fine, but you've got to make sure you drain them well. They do make the dough a little more dense because of the extra liquid, but it's not a huge issue as the scones still taste marvelous. I do want to make these again though with dried tart cherries and in a not-wedge shape. I'll post pics when I do ;). 1. In a large bowl whisk together the dry ingredients & then grate in the butter. Cut it all together with a pastry blender or two forks or knives to create a just-crumbly mixture. In a liquid measuring cup whisk together 1 egg & the heavy cream. Pour this into the crumb mixture & stir until it just comes together. Fold in the cherries until just combined (make sure the cherries are truly as drained & patted dry as you can get them if using canned!). Pre-heat your oven to 375ºF. Line a baking tray with parchment. 2. If making wedges: Form the dough into a ball & place it on a large sheet of plastic wrap. Flatten the ball into a disc about 1 1/2" thick & wrap in the plastic & place in the freezer until the oven is ready. Flour a large knife & cut the disc into 8 equal slices. Arrange these about 1 1/2-2" apart on the tray. If making mounds: Break the dough into ~2 1/2" diameter balls & place them on the tray about 2" apart. Flatten them gently into discs about 1 1/2" thick. Place in the freezer until the oven is ready. 3. Whisk the remaining egg with the 1 Tbsp. water until the egg whites are completely broken up. Brush the tops of the scones with the egg wash & then sprinkle with the turbinado/raw sugar. Slide in the oven, middle rack, & bake for about 20-25 minutes, or until golden on top & golden brown around the edges. Serve warm with tea & copious amounts of real butter (try salted). 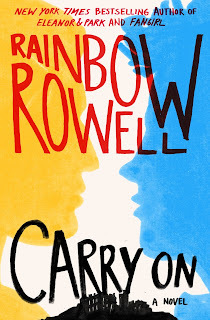 ^__^ Carry On is the best. There are so many more foods I want to make for it! This recipe looks excellent! I can't wait to try it. Also, I frequently find dried sour cherries at Middle Eastern markets, regardless of season. Hope that helps! These were SOOOO good!! The extras froze well, and it's now time for a do-over. Can't wait. I made a batch on Saturday, and my family immediately wanted more! They're so quick and easy and ohmygod delicious!!! Wonderful! That makes me happy. ^_^ Thanks so much for letting me know! How many scones will I get, if I make one portion? Hello, I would quickly like to ask how much Turbinado to use? I couldn’t quite understand how much was needed. Hi, Izzy. There isn't an exact measurement. Simply sprinkle some sugar over the scones so it sticks to the egg wash. It'll melt a bit in the heat of the oven and make a sugary coat on the top of the scones.